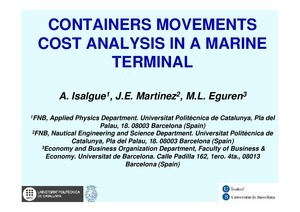 Isalgue, A.; Martinez, J.; Eguren M, M.
Isalgue, A.; Martinez, J.; Eguren M, M. Containers movement cost analysis in a maritime terminal. A: International Conference on Maritime Transport. "Maritime transport VI: 6th International Conference on Maritime Transport: maritime transport'14". Barcelona: Iniciativa Digital Politècnica, 2014, p. 514-523.